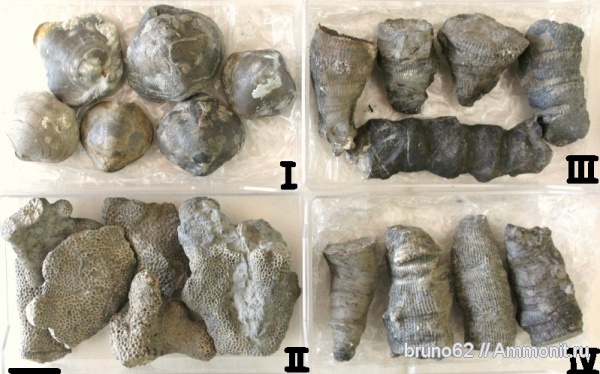 Фотогалерея: "Devonian fauna from northern France"
1/ brachiopods : Athyris concentrica (Von Buch ) 2/ Coral : Thamnopora cervicornis (de Blainville ),3/ and 4/ Cyathophyllum bouchardi (Milne-Edwards § Haime ) from northern France . Really, nice collection! And have you found other fossils along with these corals/brachipods? Cephalopods? Fish? Bruno, please always add genus and species tags to all photos. Tags connect identical fossils from different places. Еще есть Composita (от в.девон (тритиз) - н.карбон (основы)), стоит рядом с Athyris стр 141 pdf по тритизу том 2, так вот у Athyris есть концентрические пластины нарастания, а Composita их нет, а с виду одно и тоже, на том и отличаются.